ATLANTA—Expressing its desire to help those suffering in the hardest-hit regions, the Dixie company this week donated $5 million in clean drinking cups to drought-ravaged Southern Africa, a corporate press release confirmed. 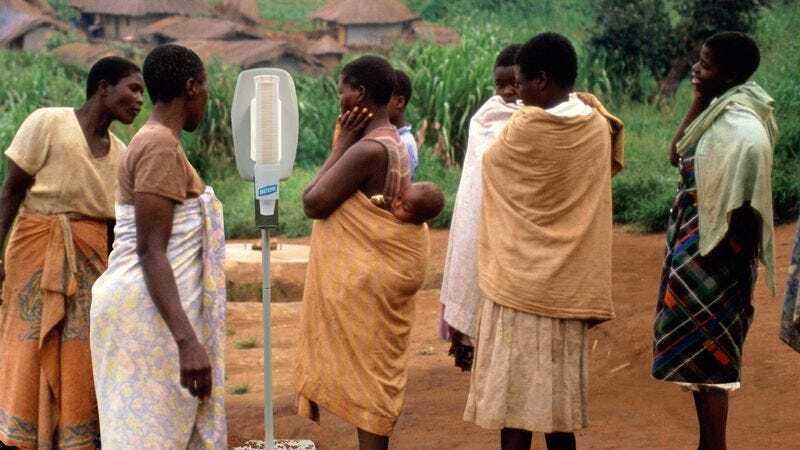 “At a time when so many families across Zimbabwe, Botswana, Namibia, and South Africa lack access to clean, reliable sources of drinking cups, Dixie is proud to step in and provide much-needed relief,” wrote company spokesman Dale Hindeman, explaining that teams of Dixie workers would install hundreds of modern dispensers in remote areas to provide local populations with a steady supply of drinking cups and would teach villagers how to properly extract fresh drinking cups from the mechanism on their own. “Tragically, many individuals in these drought-stricken areas have been forced to walk six hours or more for access to drinking vessels for themselves and their children. We here at Dixie believe this is unacceptable, and we will ensure that every man, woman, and child in these villages has access to a fresh 8-ounce cup every day.” The initiative is the company’s largest charitable effort since airdropping thousands of packaged dinner plates to starving Haitian citizens following the country’s 2010 earthquake.